Chi gift vouchers are unique pop up credit card style vouchers inside individual wallets. The voucher may be removed from the wallet and stored in your purse for convenience. Chi gift vouchers may be purchased for any amount of money or for a specific treatment or product. They are valid for 6 months allowing plenty of time for the client to enjoy their gift. *Lost vouchers will not be replaced. *Gift vouchers can not be exchanged for monetary value. *Pre-purchased gift vouchers can not be used to pay for promotional offers. *Gift vouchers can be purchased for promotional offers during the promotional month for future bookings. We want to make it easy for you this year by saving you the wrapping hassle. Many of our gifts are beautifully dressed and we have gorgeous bags and branded ribbon to put them in for you, saving you the need for extra wrapping. We have gifts available for all budgets, from £3.99-£69.00. Choose your gift and we will do the rest. The ‘pamper hamper’ is now available all year round. Choose your gift voucher value, eg £20 and we will create the hamper for just £9 extra. 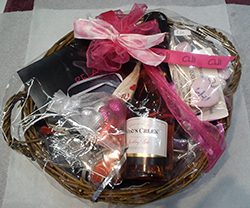 The hamper includes Jacobs creek sparkling wine, chocolates, sweets, candles and the hamper itself. Perfect as a year round gift.